Magic card boss battle introduction and rules. 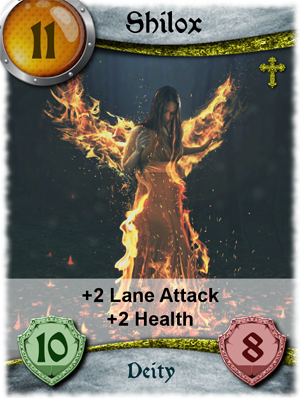 Boss battles are played out through a fast-paced magic card system with the focus on both speed and simplicity over other typical card games that can have drawn out turns and complicated management of card decks. The player starts out with a base deck and can then strengthen the deck by collecting a card during each of the platform stages or by unlocking cards using tokens. Once the player engages with darkness during a battle, there is no turning back – the player cannot disengage and leave the battle without first having to pay a penalty. Do not turn your back on the dark. A set of counters are used for each attack lane to help inflate attack and defence figures – a defensive strategy from the opponent and spells will however decrease or nullify this. 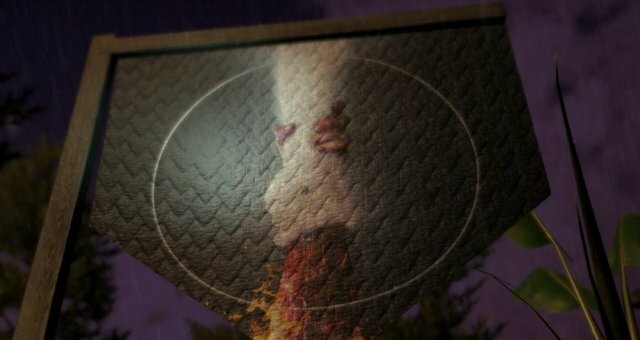 A player could cast down a firestorm or tornado to obliterate the enemy’s cards from the playing field and on the other hand, the enemy could play a full health card, which could secure him a solid victory. Manna strategy is important. If a manna card is not dealt, the player can opt to sacrifice a battle card in the Pool of Bethesda to gain one manna. This position could force the player to strategize and direct a trade-off between either having enough manna or adequate battle cards to play. Players can additionally earn spirit scrolls and strategically string up to 4 scrolls together to enhance their fighting abilities during battles. This works similarly to the dark traits for the enemy, where attack, defence, manna and health are increased by applying various classes of scrolls. At the start of a battle an indication will be given of how many rounds you need to win against each opponent. To be competitive you will need to collect a single card on each of the platform stages which in turn is added to your deck. Under token management you can unlock additional rare cards. Manna - To play a card you need to collect the same or higher amount of manna indicated on the top left-hand corner of the card. You can gain only one manna per turn by moving a manna card over one of your attack or defense slots or by sacrificing a playing card in the Pool of Bethesda. Magic cards can also be sacrificed if your manna is lower than the manna on the magic card, otherwise the magic card will be played. Lanes - There are 2 playing lanes per player. Each lane has 1 green attack and 1 red defense slot, 4 slots therefore in total. Each lane has an attack and defense counter, the attack value is taken from the attack value of the card placed on the attack slot. The defense value is taken from the defense value of a card placed on the defense slot. Attack and defense counters can be inflated or deflated by spells or card special abilities. Certain cards can use spells to nullify or decrease any inflated counters. Your attack counter plays against your opponent's defense counter in the same lane. Your defense counter defends against your opponent's attack counter for that lane. A higher value will destroy your opponent’s card and equal values will destroy both cards. The large green total attack counter in the center shows the damage the opponent will receive when your turn ends. 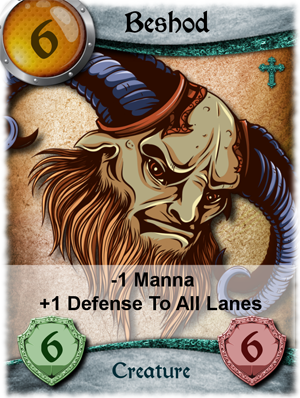 The value is the total attack value from both your lanes minus the total defense values of your opponent. 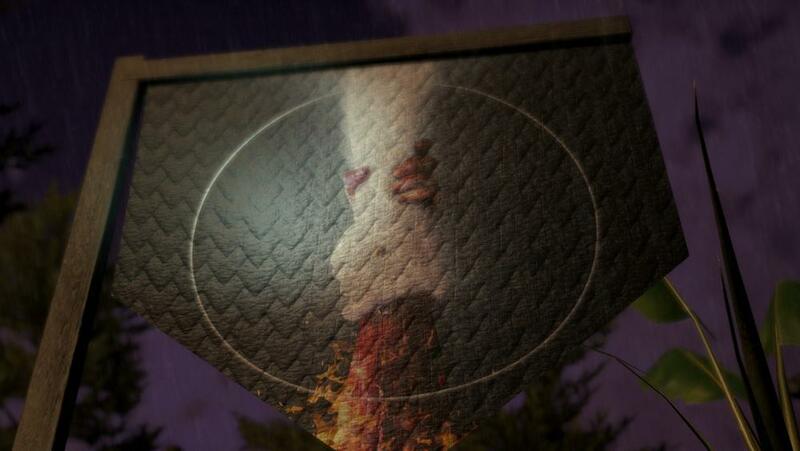 Magic cards – These cards played in the Pool of Bethesda on the bottom right of the screen. If you play a magic card but your manna is lower than the manna value on the magic card, the card will be sacrificed for 1 manna so long as you have not obtained manna that turn already. 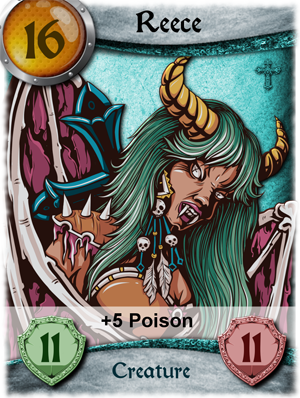 Poison - Playing a poison card will poison your opponent and health is deducted each turn. The poison indicator flashes when poisoned and indicates the value of the current poisoning. You need to play a kill all spells card to rid yourself of the poisoning. XP - You gain XP after each battle round calculated by the value of attacks during each turn and additionally the manna value of cards you destroy. You gain additional XP for defeating a boss and increased XP for defeating a Place of Shadow boss. 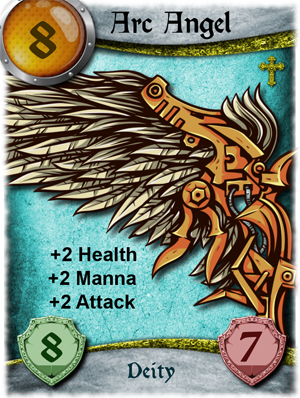 Points - You gain points after each battle round calculated by the value of attacks during each turn and additionally the manna value of cards you destroy. You gain additional points for defeating a boss and more points for defeating a Place of Shadow boss. Coins - You will earn coins for each round victory and additional coins for a boss defeat and more for a Place of Shadow boss defeat. This is multiplied by the number of bosses you have already defeated. Tokens - You earn 10 mythic card tokens and open an orange chest when defeating a boss, 20 tokens are earned, and a red chest is opened for defeating a Place of Shadow boss. Heath - Each round starts with the health you had when the battle was initially started, unless you managed to gain more health during the previous battle round. When defeated you will lose any health higher than your characters current base health. Classifications - There are 3 card classifications, namely common (grey cross), un-common (light blue cross) and rare (gold cross). Card Values - The orange indicator in the top left of the card indicates the manna value, the green shield bottom left is the attack value and red shield is the defense value. Spirit Scrolls - Allocating spirit scrolls to your 4 spirit scroll slots under your hero profile screen will give you battle advantage. These scrolls can increase your health, attack, defense or manna before a battle and can also guarantee that you start with manna of miss a turn cards in your starting hand. These scrolls are however lost when you lose a round or additionally for leaving a battle. Dark Traits – Any dark traits gained will empower bosses by also increasing their health, attack, defense and manna before each round. You can buy expensive cures for each dark trait before the battle at the shop under the hero profile screen. Boss Leaderboard - Each boss has a leaderboard, press 'L' or Xbox D-pad left/right to view. Once the boss is defeated your final round score is added to the leaderboard.